We are bad at our website. Because this isn’t a facebook post or a text, or an insta or a tweet (but we’re bad at both of those too), this site doesn’t see much action. Do most people utilize websites? Anyway, clicking the events page will redirect you to our facebook events page, which is the most up to date source for all shows at Counter Culture. Ticket links can be found in each event page. We have what is definitely our biggest show yet this Friday…The Black Dahlia Murder! It is not quite sold out yet, but it will be, so grab your tickets. We have the Forest Green holiday show on 12/22 and we’re announcing another fun one for 12/29 tomorrow! Can’t wait to see you all! Just checking into remind you of some of the great stuff we have going on here. The 10th features a great pop punk show with Lowlife Productions featuring Southpaw. The 16th will boast The Crooked Youth Tour put on by Homesick Productions. Then, Monday night, we have your childhood hero, Drake Bell in the house. This show is a partnership with Excellency Music. We have a house show on the 24th featuring our dear friends in Palomino Witchcraft and Counter Culture's own, Josh Hartley. Then on the 26th we partner up with SVSU and the Roethke Festival to bring you the phenomenal poet, Douglas Kearney, all the way from California. We'll end the month with a dance put on by Peer 360 on 3/30. And somewhere in there we're getting new art from Dillon Call! He is bringing photographs attached to the Roethke Festival as well. The Roethke Festival only happens every three years and we're very happy to partner up with them. Please make your way to their social media ( https://www.facebook.com/roethkefest/ ) and better yet, make it to an event! Hope to see you at one of ours. And if you didn't figure it out, we love to collaborate, so please get involved. We may be able to help you achieve something you never knew, well, any of us could do! We over at Counter Culture just want to stop and recognize the achievements of many great thinkers, leaders and people before us. Martin Luther King Jr. was a great man and part of a movement that is still ongoing today. We care about these issues greatly and deeply. Civil Rights means everything to Counter Culture. We want to continue to support people from every aspect of life. Diversity, in all of it's splendors is what makes us as humans, stronger. We know what it means to dream. All men are created equal. Thank you so much to the pioneers who have paved the way. We hope all of you take a moment to reflect what this means to you today. Stay opposed to those things in culture that would have you do otherwise. We don't use our website as often as we use social media. Thanks for following us over there. We started our journey in 2014. But our official start was the first week of January 2015. Thanks for seeing us through three years of arts and culture! This fall the main proprietors behind Counter Culture were absorbed into some larger companies. There has been a learning curve on making all of these things work. Their events and our own. It appears we're getting over the hill on that and we'll be back in action. 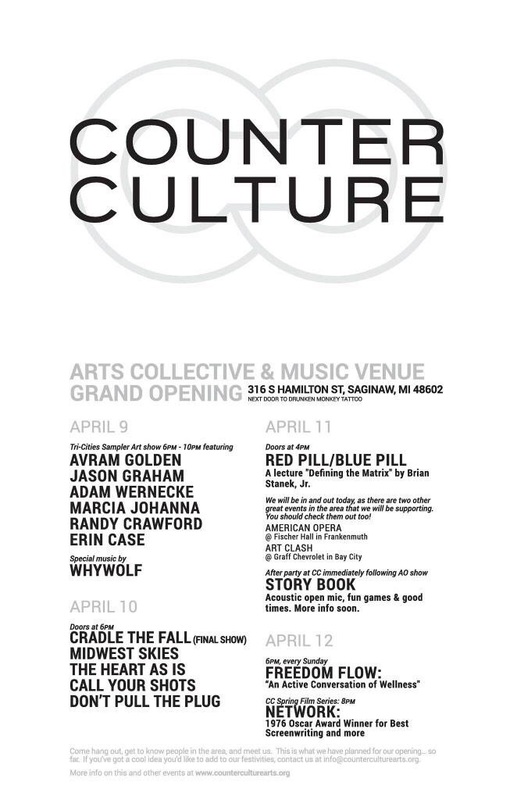 But we want to remind you, this is the Counter Culture Arts COLLECTIVE. This is a DIY/DIT space. Counter Culture is as much yours as it is anybody's. This is your year to create that event you've always wanted to. Make that piece of art, start that band, go to that protest, start that rally, buy a new bicycle. Whatever it may mean for you. We want to help. Been a while since we shared these principles. Ours are changing and refining year by year, but this is what got us to start. Taken from the lineage of The DAAC in Grand Rapids and Mess Hall in Chicago (We also share some values with Silent Barn in Brooklyn and our brothers and Sisters at the Flint Local 432). 8. We are committed to remaining non-commercial, independent and institutionally transparent. See ya at the gig baby! We've been so busy bringing you great events. Thank you to everyone who has supported us this year. We have a non-stop ball of exciting news for you. We also want to encourage you to get involved. If you have an idea, an event you want to put on, a band you'd like to bring to town, some art that you have made and would like to show off, get in touch with us. This is an Arts Collective, and we want you to be a large part of it. Enjoy the end of the year festivities and don't wait to make a resolution. Feed those dreams in your head. Make some art, go to a show (anywhere), connect with the people around you. Life starts right now.